Pneumonia and lower respiratory tract infection are the most common reasons for acute hospital admission in Denmark , with an incidence of 3.1 cases per 1000 inhabitants . Various European studies report a substantial mortality rate of 5–15% among admitted patients following pneumonia. Pneumonia affects people of all ages across all sociodemographic profiles, with greater risk in frail, older individuals . Often, patients are characterised by multiple comorbidities, low levels of function, reduced energy intake, cognitive impairment and depression . In addition, acutely admitted elderly patients are exposed to prolonged bedrest and immobilisation, causing further physical deterioration . The present feasibility study, inspired from the surgical fast-track pathways , aimed to investigate whether patients with community-acquired pneumonia may be suitable for a fast-track pneumonia pathway (FTPP) to support early progressive mobilisation as a mandatory systematic part of treatment (figure 1a). The FTPP is a practical clinical worksheet that: supports clinician decision making on, for example, the need for intravenous antibiotics; and coordinates monitoring and care according to the existing national pneumonia guidelines. The basis of the FTPP is to reduce unnecessary treatment that may delay or impede early progressive mobilisation. Moreover, using an objective physiological measurement tool, we were able to detect mobilisation, physical activity and sedentary time during hospitalisation and 10 days following discharge. We included patients aged >18 years with a radiologically verified pneumonia consecutively recruited from the medical acute ward. Inclusion was applied to new patients acutely admitted within the past 24 h. Exclusion criteria were pre-illness inability to walk with a walking aid, inability to speak Danish, and confusion or cognitive dysfunction that prohibited informed consent and the ability to cooperate with wearing the accelerometer. During hospitalisation, 24-h mobility was measured using accelerometers (GT9X Link; ActiGraph, Pensacola, FL, USA) placed at the right hip. Quantified as time (in hours) spent lying, sitting and standing, mobility was analysed using ActiLife software (ActiGraph) in addition to steps per hour. The nurse registered mobility on the standardised mobilisation care plan, which was used to document patients' mobilisation and physical activity during hospitalisation and irrespective of study participation. The patient's ability to perform various activities of daily living was assessed using the Barthel Activities of Daily Living Index (BI-100) . 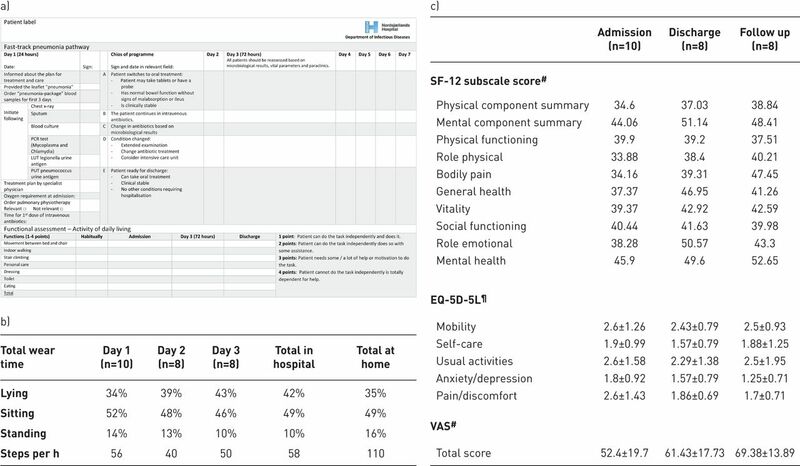 The five-dimension, five-level EuroQol (EQ-5D-5L) scale  and the 12-item Short Form Survey (SF-12)  were used to assess participants' experiences of their own health upon admission, discharge and follow-up. Due to the nature of the feasibility design, descriptive statistics were used to describe the characteristics of the study population and outcomes. Study inclusion was based on ethical requirements for giving oral and written informed consent in accordance with the Declaration of Helsinki. During the study period, 57 patients were admitted with respiratory symptoms, fever and coughing, and assessed for eligibility. 33 patients met the inclusion criteria in terms of a radiological verification of pneumonia while 23 were excluded: six were unable to walk prior to hospitalisation, eight had been hospitalised for >24 h, two had hospital-acquired pneumonia, and seven had a combination of comorbidities (dementias and confusion) in addition to being deemed cognitively unable to adhere to and collaborate with the FTPP programme and/or wearing the accelerometer. 10 eligible patients agreed to participate and none of these patients involuntarily left the study prior to its conclusion. One patient died, and one was admitted to the intensive care unit within the first 24 h after inclusion and was subsequently withdrawn from further study assessments. The patient who died was necropsied, which showed a pulmonary embolism due to previous radiation damage due to breast cancer. Patient demographics (median 74 years) showed an overrepresentation by men (80%), which was considered a random periodic outcome. 50% had a CURB-65 (confusion, urea >7 mmol·L−1, respiratory rate ≥30 breaths per min, blood pressure <90 mmHg (systolic) or ≤60 mmHg (diastolic), age ≥65 years)) score of two or more, indicating moderate to severe pneumonia. The patients' habitual level of functioning was reasonably good, with a self-reported BI-100 of 94. According to the FTPP tool, 87% of the patients were reassessed for need for intravenous antibiotics within 72 h and the total time for intravenous antibiotics was median 3.36 days. The median length of hospital stay was 4 days. Daily documentation on the FTPP interdisciplinary tool by doctors, nurses and physiotherapists was carried out 78% of the time. Based on the total number of day and night shifts documented, the mobilisation care plan was applied 70% of the time. All patients were mobilised for ≥20 min within 24 h of admission. Moreover, patients had a documented level of activity level per shift that corroborates this. The median observation time for patients in the project was 313 h (13 days) with a median adherence to wearing the accelerometer of 269 h (79%). Summarised data showed that patients during hospitalisation on average lied down for 10.08 h·day−1 (42%) with a slight increase during hospitalisation. At home, the lying period was reduced to 8.4 h (35%) with a marginal increase in standing (figure 1b). The number of steps per hour during the first 3 days of hospitalisation was remarkably low with an average of 56, 40 and 50 steps per h. At home, the average number of steps increased to 110 per h.
Most patients had various symptomatic and functional problems on admission (e.g. bodily pain, vitality and role physical) with a slight improvement at follow-up. The EQ-5D-5L score ranged from 1.25 to 2.6, with no scale showing any apparent difference over time, suggesting a relatively stable care independency. The score on the total EQ-5D-5L visual analogue scale increased from 52.4 on admission to 69.38 at follow-up, indicating an improvement in self-rated health (figure 1c). Elderly patients with pneumonia often suffer from several comorbidities and competing disabilities . In the current feasibility study, several patients were excluded due to a lack of function and/or dementia and cognitive dysfunctions, making them unable to participate in the accelerometer-based monitoring and intervention. Despite this selection, and the fact that we may have included the healthiest participants with pneumonia, the population still represent a very low level of physical activity during and after hospitalisation with only slight improvement observed. This does strongly imply the need to emphasise early mobilisation in cross-sectional care planning among this vulnerable population with significant risk of mortality [3, 10, 11]. We hypothesise that the relatively large group of patients who were too frail to be included should be offered and could benefit from a similar FTPP treatment course including an early mobilisation care plan. This is supported by research that examines early mobilisation and the study of patient progress in pneumonia treatment [10–14]. We conclude that structuring progressive patient mobilisation during complex clinical work conditions is warranted, though application of advanced technology such as accelerometers may compromise study feasibility. A stronger focus on research in this medical area is required to counteract hospital-induced sedentarism and its immediate impact on daily functioning and subsequent major outcomes. Conflict of interest: L.N. Clausen has nothing to disclose. Conflict of interest: M. Børgesen has nothing to disclose. Conflict of interest: P. Ravn has nothing to disclose. Conflict of interest: T. Møller has nothing to disclose. M. Sygdomsbyrden i Danmark – Sygdomme [The Burden of Disease in Denmark – Diseases]. Copenhagen, Sundhedsstyrelsen, 2015. Penicillin treatment for patients with community-acquired pneumonia in Denmark: a retrospective cohort study. BMC Pulm Med 2017; 17: 66-017-0404-8. BTS guidelines for the management of community acquired pneumonia in adults: update 2009. Thorax 2009; 64: Suppl. 3, iii1–iii55. Functional disability, cognitive impairment, and depression after hospitalization for pneumonia. Am J Med 2013; 126: 615–624. Outcomes in elderly Danish citizens admitted with community-acquired pneumonia. Regional differences, in a public healthcare system. Respir Med 2012; 106: 1778–1787.
. Fast-track surgery – an update on physiological care principles to enhance recovery. Langenbecks Arch Surg 2011; 396: 585–590. The Barthel ADL Index: a reliability study. Int Disabil Stud 1988; 10: 61–63. editor. EQ-5D-5L User Guide. 2nd Edn. Rotterdam, EuroQol, 2013.
. Does early mobilization improve outcomes in patients with community-acquired pneumonia? Evid Based Pract 2003; 6: 9. Effect of a 3-step critical pathway to reduce duration of intravenous antibiotic therapy and length of stay in community-acquired pneumonia: a randomized controlled trial. Arch Intern Med 2012 Jun 25; 172: 922–928.
. Clinical pathway care improves outcomes among patients hospitalized for community-acquired pneumonia. Ann Epidemiol 2004 Oct; 14: 669–675. Early mobilization of patients hospitalized with community-acquired pneumonia. Chest 2003; 124: 883–889.
. Pneumonia pathway reduces LOS and saves money. Hosp Case Manag 2000; 8: 151–154.